We’d love your help. Let us know what’s wrong with this preview of Where Treetops Glisten by Tricia Goyer. To ask other readers questions about Where Treetops Glisten, please sign up. The first two stories were great the third and final story was a bit flat. One of the best Christmas story collections I have read. Where Treetops Glisten is a really sweet and well-integrated collection of stories about one family's experiences throughout WWII. The way the collection is structured is really clever, and the novellas definitely put me in the Christmas spirit. Now that November is here, I'm feeling ready for some more Christmas music, movies, and books! The collection begins on a gentle note. White Christmas is more of a quiet story about coming together to solve a mystery and find hope during the holidays. The Where Treetops Glisten is a really sweet and well-integrated collection of stories about one family's experiences throughout WWII. The way the collection is structured is really clever, and the novellas definitely put me in the Christmas spirit. Now that November is here, I'm feeling ready for some more Christmas music, movies, and books! The collection begins on a gentle note. White Christmas is more of a quiet story about coming together to solve a mystery and find hope during the holidays. The romance didn't completely sweep me off my feet, but I appreciated the tenderness of it, and I especially enjoyed the details about Abigail's workplace (Glatz Candies) and the fact that Jackson works at a puzzle factory. How fun is that? The second story, I'll Be Home for Christmas, was my favorite of the three. I love Sarah Sundin's writing - the way she so poignantly depicts themes and sketches details about the era and the characters' personalities. She even does a magnificent job of portraying the secondary characters! But the romance between Pete and Grace especially shines with sweet moments and second chances. Not to mention Pete's interactions with Linnie (Grace's daughter). Cuteness all around! And the message of the story really resonates, especially in a season where we tend to lean on others the most. As for Have Yourself a Merry Little Christmas, I liked the change of pace. The hints of suspense kept the story moving along, despite a good dose of introspection. It's a story about making a difference and having the courage to do what's right...even when that means accepting something good you'd never thought you'd be able to have. All in all, the war-time setting of these novellas really brings out the hope of Christmas. The family connections are wonderful, and even though the stories don't bring a lot of unexpected plot twists or engaging action, they're still sweet and enjoyable reads for the holidays. And the additions of the prologue and epilogue tie the collection together in a satisfying way. This book is a perfect companion for the Christmas season. Rich in historical detail, the three charming novellas are connected beautifully, with characters you can fall in love with right away, and story lines that will tug at your heart. I love reading collections like this during the busiest season of the year. It's low-commitment--meaning, if you think you'll only have time to finish one novella, you'll still get a satisfying read. But if you're like me, after reading the first one, you'll f This book is a perfect companion for the Christmas season. Rich in historical detail, the three charming novellas are connected beautifully, with characters you can fall in love with right away, and story lines that will tug at your heart. I love reading collections like this during the busiest season of the year. It's low-commitment--meaning, if you think you'll only have time to finish one novella, you'll still get a satisfying read. But if you're like me, after reading the first one, you'll find time you didn't think you had in order to read the rest. REVIEW: I really liked this collection of three connected stories. The World War II setting and the connection between the siblings in each story added to the depth and interest of the stories. The collaboration between the authors to make the connections so strong is obvious. The storyline grabs your attention through each family member and keeps your interest until the end. My particular favorite was Tricia Goyer's story of Merry. Its lesson that appearances can be deceiving was so appropriate. But each story displayed the hope of Christmas and the promise of this hope which was especially needed during the devastating times of World War II. "But you have to choose whether to let fear and loss keep your world small or whether to let it expand to include others." "The Psalms say He collects our tears. That's an image I have clung to a different times. No tears are wasted, unless you allow their cause to freeze you in place." "If Pete gave in faith out of his nothingess, God would replenish." "Maybe that was the point of giving after all. He thought he'd given to fill others. He thought giving would allow others to fill him. But he'd had it wrong. Giving laid the holes bare and revealed his insufficiency to fill or be filled. To truly give, he had to lean wholly on God. The Lord alone could use him to help others, and the Lord alone could replenish his empty stores." "Father says that for many years he has prayed for freedom, and it came in an unexpected way. But that's how God works. He uses the weak things of the world to defeat the strong....God also brings us unexpected gifts in unexpected ways." I have to be honest and say that novellas can be hit and miss for me. My main pet peeve can be when there is no connecting factor I've really been enjoying WW2 era books this year. There is so much history there that can be used as a background and the authors who I have had the privilege to read, have used these settings to their advantage. I have to say that Tricia Goyer, Cara Putman, and Sarah Sundin combined their creativity and these backgrounds well and made a wonderful novella collection. Yeah, I know exactly what you are thinking. I just read a Christmas based book in the middle of May. I am crazy and I know it. But, yeah, I just got into a Sarah Sundin kick and decided to read this! It is actually quite good! And, I am going to write a review, BUT I will not post it until the Christmas holidays this year. Yeah, I am being kind of mean, but it isn't even close to Christmas yet. But, I will say that I really enjoyed this book!! Since my siblings and I just put up our Christmas tre Yeah, I know exactly what you are thinking. I just read a Christmas based book in the middle of May. I am crazy and I know it. But, yeah, I just got into a Sarah Sundin kick and decided to read this! It is actually quite good! And, I am going to write a review, BUT I will not post it until the Christmas holidays this year. Yeah, I am being kind of mean, but it isn't even close to Christmas yet. Since my siblings and I just put up our Christmas tree and decorations, I decided to do a Christmas book review! Before I go any further into my review, I have to confess something. I read this book in the middle of the summer. Yeah, I am kind of weird like that, reading Christmas novels in the middle of summer. So, there you have it, I have confessed. And, I also love watching Hallmark’s “Countdown to Christmas” movies in the summer. I really liked this book! It is nice when three or four novellas are put into one book. Novellas are really fun to read because they are short. They don’t take a lot of time–just ten to twenty chapters. I am trying to decide which novella I liked the best out of the three. Each one was good so it is hard to decide. But, after a few moments of thinking, I have determined on my favorite. I’ll Be Home for Christmas is the one I enjoyed most. I do have to admit that I do like Sarah Sundin as an author in general. But, I read with an open mind! Each book was very good. I am not saying the other books were not good. They all were! I just thought that if I was reading a book with three novellas in it, I should say my favorite. The cover was good too! It was creative. 4 stars to you as well! So I would like to give this book a rating of 4 stars! In Where Treetops Glisten, the authors have written three Christmas novellas featuring one family, the Turners. In addition to the continuing family connection, the stories are further intertwined by their setting—Lafayette, Indiana—and the time period—World War II. Cara Putman, Sarah Sundin, and Tricia Goyer are each known for their skill in writing stories set during World War II, and nowhere do these skills shine brighter than in these novellas. I loved the fact that the stories followed one In Where Treetops Glisten, the authors have written three Christmas novellas featuring one family, the Turners. In addition to the continuing family connection, the stories are further intertwined by their setting—Lafayette, Indiana—and the time period—World War II. Cara Putman, Sarah Sundin, and Tricia Goyer are each known for their skill in writing stories set during World War II, and nowhere do these skills shine brighter than in these novellas. I loved the fact that the stories followed one family through the war, so when I finished reading the first novella I could pick up the continuing thread in the second and the third. In Winter Wonderland, Cara Putman tells the story of Abigail Turner, whose beau was killed at Pearl Harbor. Abigail has vowed never to allow herself to suffer loss again. However, a hard-working young man who is struggling to support his widowed mother tempts her to soften her stance. I’ll be Home for Christmas, Sarah Sundin’s delightful novella, features Abigail’s brother Pete Turner, Grace Kessler, an over-burdened young mother, and Grace’s handful of a daughter, Linnie. This story is a delight on many levels. Pete and Grace each have issues to overcome, while Linnie persists in running away with the story. Tricia Goyer takes readers near enemy lines in Have Yourself a Merry Little Christmas. Merry Turner is a nurse serving in the Netherlands, close to the German border. Merry became a nurse in order to serve her country. She hopes by her service and the distance from home that she can heal her broken and betrayed heart. Sometimes gritty, but always gripping, Have Yourself a Merry Little Christmas brought me to tears a time or two. This is the most enjoyable Christmas collection I’ve ever read, and I recommend Where Treetops Glisten highly. This book would make a wonderful gift for the readers on your list, but be sure to buy a copy for yourself. You won’t be sorry. 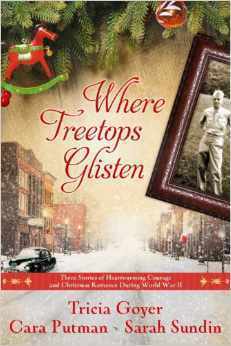 Where Treetops Glisten is a novella collection set around Christmases during WWII. I’m not typically a big fan of novellas, simply because they always feel too short to me, but I really enjoyed these. They are closely linked, as the main characters in each are siblings. There are 3 in this collection, which allowed the authors to make them a little longer than the typical novella, without having a huge book as the result. I really enjoyed Great Christmas collection! I really enjoyed this novella! Abigail Turner is the middle child of the family now, though not by choice. She lost 2 siblings when she was a child and after losing her boyfriend to the war, is very skittish of new relationships. I found Abigail to be a realistic character and enjoyed getting to know her. I could easily relate to what she was going through and quickly fell in love with her character. Her fear of losing someone else is pretty much the crux of the story. Her desire to get to know Jackson Lucas and perhaps have a relationship with him hangs on whether or not she can let go of the past and allow herself to love again. I enjoyed Jackson’s character as well. He is strong, kind, and very patient with Abigail. At the beginning of the story he has his own issues to deal with, including a bit of a mystery, so that kept everything moving forward, as he and Abigail got to know each other. My only complaint is that I felt the ending was a little rushed and a bit unrealistic. In this novella, we get to follow Pete Turner’s love story. I try really hard not to play favorites, but I think this one was mine. Pete comes home from war struggling to escape the horrors he witnessed and the weight of losing friends. I appreciated the realism in that, though it was glossed over a bit. He feels empty and the pastor tells him to give, which makes no sense at all to Pete. But he learns the truth in the pastor’s words when he comes across Linnie, an adorable little girl who is out wandering. Now we get to why this story was my favorite . . . I adored Linnie! She was so cute and sweet! I loved her relationship with Pete and how she often taught him something, instead of the other way around. Grace Kessler is the heroine and Linnie’s mother. She and Pete have a history and she doesn’t regard him fondly at their first reunion. She remembers him as the bully from her childhood years and isn’t all that excited when he offers to watch Linnie for her. I can’t pinpoint one thing in particular that I liked about Grace, I just really enjoyed her character. Maybe it was the banter between them, or her willingness to forgive past hurts, or how she cared for Linnie, whatever it was, Ms. Sundin did a great job! The romance didn’t feel rushed, which surprised me. I think it may have been because Grace and Pete had known each other before and started from there. They also spent a lot of time talking and getting to know one another better, rather than just jumping into being in love. Also, Linnie was often the focus, which kept it off their relationship a bit. I also especially appreciated the spiritual aspect of this novella. It is a bit more prevalent here and focuses on allowing God to fill the empty spaces in your heart, rather than trying to use people to make you whole. In this story, we get to know Meredith (Merry) Turner, the last Turned sibling still single. I must confess I didn’t like this one as well as the others. Merry had her heart broken at the beginning of the war and is still struggling to move past the sense of betrayal and abandonment she feels as a result. I found it rather difficult to relate to Merry and didn’t connect with her at all. I really wanted to like her, but she seemed a little childish, focusing on something that happened 3 years ago and constantly contemplating the fact she couldn’t be home for Christmas. Also, a couple of her reactions didn’t make any sense to me and made me want to shake her. There was actually very little dialogue between the protagonists, which was kind of annoying. I wanted them to talk, spend time together, something. But Merry spent most of her time with Nancy, one of her fellow nurses. Also, we rarely see anything from the hero’s point of view, which I suppose makes sense on some level, but I would have liked to know what he was thinking a little more often. Overall, the novellas were all good in their own right. I really enjoyed the epilogue, which pulled everything together and allowed us one last glimpse into the Turner family. The thing that most impressed me about this book how well each of the stories flows with the others. It being written by three different authors, I had anticipated some discord between the novellas, but each character’s personality and the important aspects of who they are stayed the same throughout the book. I liked the premise of the series and if I would have liked a few things to be different, then that’s just my personal preference. This family was so endearing. I loved how each story connected and featured a set of siblings. I'll Be Home For Christmas by Sarah Sundin was one of my absolute favorite Christmas novellas! I love Christmas stories. They are full of hope, as these three historical novellas were. The stories are all set around Christmastime as the sounds, sights, and smells of Christmas are present, such as mistletoe, Christmas treats, gifts, snow, and when family come home to be together. I loved how small gifts, especially those that weren't physical gifts, played a large part of each story. I also loved these characters and how they each found and gave of themselves. It was a time of rationing, w I love Christmas stories. They are full of hope, as these three historical novellas were. The stories are all set around Christmastime as the sounds, sights, and smells of Christmas are present, such as mistletoe, Christmas treats, gifts, snow, and when family come home to be together. I loved how small gifts, especially those that weren't physical gifts, played a large part of each story. I also loved these characters and how they each found and gave of themselves. It was a time of rationing, walking where you could to limit gas consumption, only being able to purchase cardboard toys because metal and wood were in high demand for the war, and using everything you had. There was such a feeling of gratefulness and humility, but also of unity in heartache for those that had been lost to the war and in supporting the soldiers and hoping for an end to the strife. All of these feelings embody so much of what Christmas is, or at least should be, and were woven through each story. Cara Putman’s White Christmas didn't connect with me as well as the other two stories. The pacing was fairly slow and I think maybe the resolution was almost too easy. I did love getting to know more about the Turner family. The parents and grandma were all great characters and added much to the story. I also enjoyed seeing first love through the eyes of Abigail and Jackson. It was rather humorous that Abigail had committed to one thing only to find that she had no control over what her heart decided. Sarah Sundin’s I’ll Be Home for Christmas grabbed me from the beginning. I loved how Pete and Grace met and how cute and fun Grace's little daughter, Linnie, was. I also loved the feel of tension that turned into something much more meaningful over time. There was a heaviness to the story from the burdens these two main characters' carried, but also a playfulness and feeling of hope for what might come if they would both only learn to trust each other, and also God. I loved their interactions and the interactions between the whole Turner family with Grace and Linnie. Her precious Christmas gift was a definite highlight as was the sample spoons. I really loved this story! Tricia Goyer’s Have Yourself a Merry Little Christmas started off so sad. I literally began tearing up reading about these injured men and these doctors and nurses who fought to help heal both their physical and emotional wounds. Merry was so brave to volunteer to help, even risking her life to do so. I enjoyed getting to know Merry better and also enjoyed getting to know David or "Daaf" as he's called. There were quite a bit of inspirational moments as both characters tried to figure out what to do. This was another sweet and enjoyable story. I especially enjoyed the end when the Turner family was gathering to celebrate Christmas again. Where Treetops Glisten was filled with three lovely, sweet, and heartfelt stories. Stories that reminded me of the best feelings of Christmas, of family, friendship, learning to carry on, forgiveness, the spirit of giving, gratitude, and love. Each story touched my heart in some way. They were short and hopeful stories, and left me with a feeling of happiness. My thoughts: This was a very sweet romance, with a hero that I couldn't help but fall in love with and a bubbly, sweet and intelligent girl who thinks her dad hung the moon. Even though Abigail doesn't want to have a relationship after her fiance died, she didn't reject friendship when a hurting, needy man crosses her path. I loved this story. I have only read one of Ms. Putman's books so she isn't an author really familiar to me. I might have to look up more of her books. My thoughts: This was a totally great story! I absolutely adored Pete! He had a difficult uphill climb to "give" the way his pastor suggested to this family. The black moment almost made me cry and made me absolutely furious at Grace. I know I'll sound like a broken record here, but I loved this story! I have read all of Ms. Sundin's books so far, and enjoyed them all, but I absolutely loved this Christmas novella! My thoughts: i've read all of Ms. Goyer's books, too. I love how she gets to the heart of the action, showing us behind the scenes secrets of WWII that probably not many of us living today know about. HAVE YOURSELF A MERRY LITTLE CHRISTMAS is set in a tiny village in the Netherlands. And God worked a Christmas miracle in hearts. Beautiful story. Though there were sad parts in this one that might cause a tear or two. Final thoughts: I know I said this before with other novella collections, but I am so glad other big publishers have started to do novella collections. These are such great reads at any time of the year. I highly recommend WHERE TREETOPS GLISTEN for a fantastic WWII holiday read! Historical readers will want to start their holidays off by reading WHERE TREETOPS GLISTEN. This collection is perfect for putting you in the holiday spirit. Nostalgic song titles, scenes set in beautifully decorated Christmas venues, and holiday memories make this a book I'll return to every Christmas along with my favorite Christmas movies. White Christmas - Cara Putman's story is like all of your favorite things about Christmas wrapped up together in one lovely package. Abigail Turner works in a candy store and Jackson Lucas works at a toymaker's. (After reading this I had to YouTube This collection is perfect for putting you in the holiday spirit. Nostalgic song titles, scenes set in beautifully decorated Christmas venues, and holiday memories make this a book I'll return to every Christmas along with my favorite Christmas movies. White Christmas - Cara Putman's story is like all of your favorite things about Christmas wrapped up together in one lovely package. Abigail Turner works in a candy store and Jackson Lucas works at a toymaker's. (After reading this I had to YouTube candy cane making so I could see how it's done.) Jackson's financial trouble could ruin Christmas for his family. Already uncertain about risking her heart, Abigail wonders what else Jackson is hiding. I'll Be Home for Christmas - is Sarah Sundin's story about second chances. Ever since Grace Kessler's husband was killed in battle, she's had trouble handling their six-year-old daughter who likes to slip away from her nanny and roam the city alone. Pete Turner sympathizes with little Linnie . Once he was an ornery kid and he'd spent a fair amount of time getting Grace's brother into trouble, as Grace remembers all too well. Has Pete matured enough to trust him with Linnie...and with her heart? Great romantic tension. Have Yourself a Merry Little Christmas - OK, I'll admit I didn't catch the pun until just now as I was typing it. Merry Turner & Title of the Novella ...maybe I'm just slow. Merry Turner had her heart broken when her prewar boyfriend left the States to fight for the fatherland. As her nursing unit approaches the German border through the Netherlands she can't stop hearing David's voice in the local accents and catching glimpses of his features in the faces of the injured German soldiers. I don't want to say too much, but this story has a fascinating "what if?" to keep the conflict strong. So maybe it's bad form for authors to mention their own writing experiences in a review. If so, please forgive me, but I have contributed to a novella collection before and what impressed me most about this collection was the interlocking story lines. Each story featured a Turner sibling and included a lot of family background and shared characters. This is not easy to do when the story is a cooperative effort between three authors, but the Misses Putman, Sundin and Goyer do a remarkable job of keeping the events flowing seamlessly. If you are interested in behind-the-scenes information, don't forget to read their Author Chat in the back of the book where they discuss the lengths they went to in order to keep their characters and settings consistent. Fascinating! Cara Putman's novel is the first one in this collection, and I was instantly caught up in the lives of Abigail and Jackson. While, WWII is pretty much in the background of this novel, it has a subtle impact on their lives. Jackson's story starts out with a bit of mystery and is really the line that moves this story forward. Abigail's story is more along the emotional side as she deals with wanting to protect her heart. While I enjoyed the story quite a bit, I didn't feel swept away in it. Precocious children have a way of bringing humor into a story. The child in this story, Linnie, had me laughing out loud while reading this novella. Sundin's novella included such a wonderful message, about how we all have a God-sized hole in our hearts, and only He can fill it. The struggles that Pete and Grace have in their lives and they ways they look to find peace in their lives are the fodder for a wonderful story to unfold with plenty of Christmas romance. I adored this story, and fell in love with the characters in it. Tricia Goyer's novel had an interesting premise, and I was interested to see how it would all play out. The story has a strong focus on the gifts and blessings that God places in our lives and how much better off we are when we choose to accept those gifts. It was an interesting story that takes readers to the Netherlands near the end of the war and also a bit into the Dutch Resistance. Overall, I really enjoyed this collection of novellas. The three stories are sandwiched between a prologue (written by Sarah Sundin) and an epilogue (written by Cara Putman) that are from the grandmother's perspective, while the three stories belong to each of her grandkids. I loved the flow of the stories and how they each took place at a different point of time in the war. With three different authors writing, each character seemed to take on a fully different personality in a way that doesn't happen as strongly when one author writes a variety of stories in a collection like this. This is a great novella collection that I would consider adding to your list of books to read this Christmas season. The World War Two setting adds to the charm, as there are not as many Christmas stories set in that time period, ev When you see a book on the shelf written by this caliber of authors, you have to pick it up. The blend these three authors give to a story forms a seamless line up of three separate stories. Three characters, from the same family go their different ways in this Christmas story. Each one has their own unique story to tell, and because of this you will find yourself drawn in quickly. The theme of Christmas songs will have you humming and likely reaching for your DVD of White Christmas or CD of Bing Crosby songs. Do you want a Christmas read, but you like a little bit of depth in your "lighter" books as well? This is the book for you. It is not a heavy read, but it will make you stop and think throughout the stories. These authors are all well known for addressing issues in a very tasteful way, so this book would be appropriate for teens as well as adult readers. Topics of war are discussed, and there are some light romantic scenes, but it is done very skillfully. Three tied together stories of the Turner family, Abigail, Pete, and Meredith, all set during World War II, by three different authors, and smoothly brought together. I love these stories, and found myself right back in the 1940’s with them. Whether it was in Lafayette, IN or in the Netherlands, I felt I was there, and completely absorbed in this read. There has been heartache in this family, but the love of God has made this early life the joy that they have found. There is mention of lost siblin Three tied together stories of the Turner family, Abigail, Pete, and Meredith, all set during World War II, by three different authors, and smoothly brought together. There has been heartache in this family, but the love of God has made this early life the joy that they have found. There is mention of lost siblings, and they are carried and mentioned in each of the novellas. Do you love, or not, if you do you might be hurt, or someone could die. Yes, that is life, and you find this theme being brought forward by these authors. Enjoy the Holiday season, and especially the Gift of Christmas shown though the sharing of these stories. I loved it, and wanted a lot more. Where Treetops Glisten kindles warm feelings of nostalgia in the hearts of readers. Journey down memory lane to a time when pleasures were simple and courtship was virtuous. Linger in the warm feeling of patriotism, but be prepared to grieve over the ravages of war. The trio of Tricia Goyer, Cara Putman, and Sarah Sundin author this World War II romance in perfect harmony. **I received this Where Treetops Glisten kindles warm feelings of nostalgia in the hearts of readers. Journey down memory lane to a time when pleasures were simple and courtship was virtuous. Linger in the warm feeling of patriotism, but be prepared to grieve over the ravages of war. The trio of Tricia Goyer, Cara Putman, and Sarah Sundin author this World War II romance in perfect harmony. I found it neat that each "story" was written by different authors. It gave an added feel of each sibling being unique and different. My favorite was the first story, but I liked the other two a whole lot too. The added touch of a short chapter at the beginning and end of the book with Grandma as the main character tied everything together in a lovely way. Even though there is a bit more "sensation" of kissing and touching than I like, it wasn't enough to turn me off. I know I'll be rereading thi I found it neat that each "story" was written by different authors. It gave an added feel of each sibling being unique and different. My favorite was the first story, but I liked the other two a whole lot too. The added touch of a short chapter at the beginning and end of the book with Grandma as the main character tied everything together in a lovely way. Even though there is a bit more "sensation" of kissing and touching than I like, it wasn't enough to turn me off. Oh, I really enjoyed this collection of WWII novellas so much. Rich in nostalgia, each story reminded me of the old Christmas movies where love and hope mingle timelessly. Truly, if you love Miracle on 34th Street (the original with Natalie Woods), White Christmas, and It's a Wonderful Life, you will LOVE this collection. Historical content adds the authenticity necessary to bring readers into an era where tinsel and mistletoe made the season bright in spite of the war threatening to diminish th Oh, I really enjoyed this collection of WWII novellas so much. Rich in nostalgia, each story reminded me of the old Christmas movies where love and hope mingle timelessly. Truly, if you love Miracle on 34th Street (the original with Natalie Woods), White Christmas, and It's a Wonderful Life, you will LOVE this collection. Historical content adds the authenticity necessary to bring readers into an era where tinsel and mistletoe made the season bright in spite of the war threatening to diminish the true Spirit of Christmas. Very often a novella collection just seems to hit the spot, and there's something special about a Christmas collection. Where Treetops Glisten is a seamless collaboration by three talented writers who just happen to know quite a bit about World War II - Tricia Goyer, Cara Putman, and Sarah Sundin. With its family emphasis, spiritual insights, World War II theme, romance, and the clever use of beloved Christmas carols that debuted during the era, this collection stands out among other Christmas stories. While the authors' writing flows together effortlessly, I liked that I could recognize each one's unique voice. These entertaining and uplifting stories couldn't be more perfect for the Christmas season! Spanning three Decembers from 1942 to 1944, Where Treetops Glisten centers on the Turner siblings and their experiences during the war. Characters are richly drawn, the romances are heartwarming, and the realities of war are not downplayed. Whether set at home in Lafayette, Indiana or on the front in the Netherlands, the characterization and historical detail makes each story feel real. The contrast in mood also worked extremely well, making the overall collection very appealing. I enjoyed each story and wouldn't want to pick a favorite, for they felt like three parts of a whole. It was in Cara's story that I first connected with and fell in love with the Turners, a family who had known deep grief, but still believed in God's providence during tumultuous times. The wise grandmother, Louise, gives the stories cohesion, but Mr. Turner is a strong character in White Christmas and the mutual love and respect between he and Abigail was moving. Abigail's sensitivity made her so easy to connect with - a college student who "felt overlooked in between a fighter pilot and soon-to-be nursing sensation." Cara's story brings out how God places people in our path when needed, and I thought Grandma's words to Abigail especially meaningful: "No tears are wasted, unless you allow their cause to freeze you in place." Sarah's story focuses on a war hero returning home with memories he can't forget, a man who had retreated into "numbness, hard work, and solitude." There's good character depth as we see the contrast between Pete's old life and the person he had become in Christ. And Grace's daughter, Linnie, will steal readers' hearts! Sarah's story contains another voice of wisdom that I appreciated, and that's Pastor Hughes. I think his advice - not to try to be as good as someone else, but to be the best we can be - speaks to all of us from time to time. And his words to Pete offer godly wisdom when we just can't seem to move forward: "When you're empty inside, the best thing you can do is give. Find a need, step outside of yourself, and give." Tricia's moving story takes us to the frontline, in a field hospital in the Dutch village of Nieuwenhagen, and enables the reader to feel the horror of war. Merry, who wanted to leave the small town of Lafayette behind, comes to realize that she is here by God's design - and there's a romantic twist that readers will love. Daaf, who worked at great risk "to save the lives of the defenseless and helpless," is a character I greatly admired. The words of his uncle are speak to us all: "Remember that there are times when your life must take a backseat to the needs of many. . . . Remember that there are some things worth fighting for." Where Treetops Glisten is one of my favorite Christmas reads and I highly recommend it to all readers. Where Treetops Glisten is three novellas in one. All of them are about different family members in the Turner family. The settings vary from Lafayette, Indiana on a Christmas Eve in 1941, from to the Netherlands during the war. All of the stories are titled after Christmas songs of the WWII era. I loved the premise of each story, but liked some more than others. The prologue, Winter Wonderland, was abrupt and rushed and I didn't connect with it at all. That being said, I still like Where Treetops Glisten is three novellas in one. All of them are about different family members in the Turner family. The settings vary from Lafayette, Indiana on a Christmas Eve in 1941, from to the Netherlands during the war. All of the stories are titled after Christmas songs of the WWII era. That being said, I still liked the connection between the stories in When Treetops Glisten. The entwining stories all would work as a stand-alone as well. White Christmas, by Cara Putman, has a good storyline, but I found the repetitive "telling" in the story tedious at times. After initially telling the main character, Abigail Turner, is afraid to love there should've been more "showing" instead of repeating the fact over and over. I found it distracting and it made it hard for me to completely immerse myself in the story. I also wanted to slap them. The repetitive "refuse to fall in love" plot was tiring. I struggled to finish the story. That doesn't mean I didn't relate to the characters, it's just that it seemed kind of juvenile and…well, a bit more of a read for a teenager. White Christmas is a story of courage, growth and trust. I’ll Be Home for Christmas, by Sarah Sundin, is my favorite novella of the three. I loved every character, the setting and the storyline. This story is a mix of so many things, most of all faith and love. A pilot in the war, Pete Turner, returns to his home of Lafayette Indiana after completing his tour of combat. Like many soldiers, he is emotionally and physically scarred and looks forward to a calm life back home. One day, while walking down the main part of his small town, he encounters Linnie, a high-spirted child. Alone. With no parent in sight. Linnie informs him that he is going to be her new daddy. He searches for the child's home, assuming the worst of her mother. Upon meeting Linnie's mother, Grace Kessler, he realizes how worried and caring she is, and feels bad for thinking ill of her. Grace and Linnie change his world to a brighter place—until everything comes crashing down. I adored Linnie, her antics and honesty shone through. Grace's love for her child, and the fact she is a working single parent in the 1940's is a wonderful twist. She is doing it on her own, with no need for a man…yet can she welcome Pete Turner completely into her heart when she discovers he lied to her? It seems both characters are strong, independent and intelligent, but Linnie wants them to be together as a family. At times, things run smooth and I was certain they would end up together. Then a twist…and another twist. Oh my gosh, how I loved this story! I’ll Be Home for Christmas is a charming, believable and heart-wrenching story. I adored it. Have Yourself a Merry Little Christmas, by Tricia Goyer, is a story about Meredith, the youngest of the Turner family. Intent on setting herself apart as baby of the family she joins the war effort as a nurse in Nieuwenhagen, Netherlands on the frontlines. While nursing the soldiers, including the enemy, she also nurses a broken heart of her own. Left alone by the man she loves, all she has left is his abrupt goodbye letter. She and David had a budding romance, full of promise, and she has no idea where he is or why he left…or why he had Nazi pamphlets in his room. Was she in love with a traitor? She leaves everything in the hands of God, and tries her best to move on. Until she thinks she spots him on the outskirts of town. The constant surprises, trials, and passion is a page turning phenomena. The characters are well-developed, and their stories are beautifully told. Have Yourself a Merry Little Christmas is a well written and beautiful story. Three siblings find hope and love at Christmas during a war torn world. White Christmas by Cara Putman - It's been a year since Pearl Harbor and Abigail Turner tries to heal her grieving heart at the loss of her high school sweetheart in Pearl by staying busy as a college student and working at a one-of-a-kind candy shop. She doesn't feel ready for any sort of romantic relationships, at least not until she meets Jackson Lucas, a young man with a big problem. As Abigail and Jackson find their path Three siblings find hope and love at Christmas during a war torn world. White Christmas by Cara Putman - It's been a year since Pearl Harbor and Abigail Turner tries to heal her grieving heart at the loss of her high school sweetheart in Pearl by staying busy as a college student and working at a one-of-a-kind candy shop. She doesn't feel ready for any sort of romantic relationships, at least not until she meets Jackson Lucas, a young man with a big problem. As Abigail and Jackson find their paths crossing over and over, she begins to fall for this gentle man. Can love truly heal all wounds? My thoughts: This was a sweet story. I loved the interactions of Abigail and Jackson. I loved how he was determined to provide for his family and that Abigail's father was willing to help with his problem. Overall, this story was sweet and made me go "awe." Rating - 4 stars. I'll Be Home for Christmas by Sarah Sundin - Pete Turner is a fighter pilot returned from the European front in December of 1943. He's hoping to find the hope and peace his time overseas has stolen from him. When he meets a little girl in desperate need of a friend, Pete finds his heart melting a little. Yet can he convince her widowed mother that he's not the same bully of a boy she once knew? And will Grace allow herself to love another man whose dangerous Army job may cost him his life? Have Yourself a Merry Little Christmas by Tricia Goyer - In December 1944, Meredith "Merry" Turner in an Army nurse in the Netherlands. She's had her heart broken once and is wary of trusting another man. Yet when she comes into contact with the one man who broker her heart, will she listen to him or run away? My thoughts: Of the three novellas, this is the only one set on the front lines. I loved how Merry kept trying to forget David but couldn't. I also loved how when she finally meets up with him, that they both realize how much wasn't shared that could have prevented a big misunderstanding. And the villagers in the town were pretty sweet in all that they provided for the Americans. Rating - 4 stars. Overall thoughts: I loved how this book takes you through the entire war beginning with Christmas 1941 in the prologue and ending with Christmas 1945 in the epilogue. I think next to the Civil War period, WWII is my favorite time period to read about. I loved how all three authors tied their stories together. I received the Kindle copy as well as a paper copy for free from Blogging for Books for the purpose of reviewing. My thoughts and opinions are my own. Recommended to fans of WWII fiction, Sarah Sundin, Tricia Goyer, and Cara Putman. When I found out that two of my favorite authors were teaming up with a new-to-me author to write a book of three historical romance novellas taking place at Christmastime, I was so excited. Add that to the fact that the stories were to take place in my hometown, and I was literally jumping up and down! Sarah Sundin has quickly become one of my favorite historical fiction authors over the last few years that I have been doing book reviews. Her attention to the historical details is the best, and When I found out that two of my favorite authors were teaming up with a new-to-me author to write a book of three historical romance novellas taking place at Christmastime, I was so excited. Add that to the fact that the stories were to take place in my hometown, and I was literally jumping up and down! I think one of the best things about this book was how each story fit together with the others. You could tell that each was written by a different author, but the book as a whole was seamless. It is just amazing to me that three authors with varying styles could come together and create three stories that fit together so nicely. I don't know if I could say which of the three novellas was my favorite. I liked the detailed setting of Lafayette in Cara Putman’s White Christmas, I appreciated the growth of the characters in Sarah Sundin’s I’ll Be Home for Christmas, and I adored the right-in-the-thick-of-things storytelling in Tricia Goyer’s Have Yourself a Merry Little Christmas. But if I had to choose -- I think I liked Cara Putman's story the best. It set up the rest of the book so well, and her detailed description of Lafayette really sold it for me. On the whole, this book was really good, and it was perfect for Christmastime. I will admit that I am a bit biased towards it since I live in West Lafayette. I know that fact affects my review and rating at least a little bit. These stories are very much on the romantic side and could even be considered hokey by some. While there are some realistic components and excellent historical details, the stories are definitely fiction. Of course everything is wrapped up nicely with a big Christmas bow at the end. But isn't that what we all want with a collection of Christmas novellas anyway?! Where Treetops Glisten has all of the things that I love about Christmas stories – a great setting, interesting characters, and the warmth and love of the holiday season. This is the story of three siblings forging new paths and finding love in three short novellas filled with the wonder of Christmas. Turn back the clock to a different time as the realities of America’s involvement in the Second World War change the lives of the Turner family in Lafayette, Indiana. The first book is White Christmas by Cara Putman. Abigail Turner is a college student and part-time employee at a candy shop. The loss of a beau to the war has Abigail vowing to not fall in love until a This is the story of three siblings forging new paths and finding love in three short novellas filled with the wonder of Christmas. Turn back the clock to a different time as the realities of America’s involvement in the Second World War change the lives of the Turner family in Lafayette, Indiana. The first book is White Christmas by Cara Putman. Abigail Turner is a college student and part-time employee at a candy shop. The loss of a beau to the war has Abigail vowing to not fall in love until after the war. Can a hard-working young man with a serious problem who needs her help change her mind? The second book is I'll Be Home for Christmas by Sarah Sundin. Pete Turner (Abigail's brother) is a fighter pilot hero returned from the European Theatre. His time at war has left him drained and empty of all grief, all anger, and all joy. All Pete wants is something to make him feel again. His pastor has told him that when you feel empty inside the best thing you can do is give. When he encounters a precocious little girl in need of his friendship, can he convince her widowed mother that he's no longer the bully she once knew? The third book is Have Yourself A Merry Little Christmas by Tricia Goyer. Meredith Turner ("Merry" to those who know her best and the youngest of the Turner siblings) is using her skills as a combat nurse on the frontline in the Netherlands. Halfway around the world from home, Merry never expects to come face to face with the German man who betrayed and abandoned her three years ago, but that’s precisely what God has in mind to redeem her broken heart. I enjoyed this book for the most part. I couldn't get into the first book and ended up skipping through it to get to the second book. I really enjoyed the second book. The story of a single widowed mother with a little girl missing her daddy really tugs at your heartstrings. The story was well written and I liked how Pete was able to redeem himself of his bully past with Grace. Very heartwarming story. The last book was pretty good also but I think I've decided that reading about nursing and WWII is not one of my favorite genres. I did like the fact that Merry and David got a second chance at love. And I liked that this book had an Epilogue that brought the stories of the three siblings together. All in all a good book with the continuity of the stories of three siblings. Early 1940s war rages and yet life goes on. Abigail's father is an attorney and she is a college student, but still she works two jobs and attends school. She meets Jackson in the candy store and learns that he is working to save the family farm (but not working the farm, more on that later) that is about to be foreclosed on. Sensing Jackson needs help to unravel the problem, Abigail takes him to her father who begins working on the issue. Jackson is not off fighting nor is he farming the land b Early 1940s war rages and yet life goes on. Abigail's father is an attorney and she is a college student, but still she works two jobs and attends school. She meets Jackson in the candy store and learns that he is working to save the family farm (but not working the farm, more on that later) that is about to be foreclosed on. Sensing Jackson needs help to unravel the problem, Abigail takes him to her father who begins working on the issue. Jackson is not off fighting nor is he farming the land because as a child he had polio. Can Jackson's problems be unraveled? This is a sweet story abounding in friendly help and sweet romance. When Pete Turner returns on furlough he meets Grace and it is under a distressful situation - Grace's little daughter has run off again. She does this looking for her father who died in WWII as a pilot. The sparks fly between Pete and Grace in more ways than one. They knew each other as children. Grace has issues with trust. The romantic interest twinkles and glows. But the heart of the story is little Linnie. You'll love her as she melts your heart and those of the characters in the story. This time the Turner family member is in the heart of WWII as a nurse tending the Allied wounded and some German soldiers as well. Tending a broken heart of her own, Meredith guards herself as she cares for the broken bodies of the soldiers. Her broken heart's past catches up with her in the Netherlands. What does it take to mend Meredith?